Can a wartime president earn his Nobel peace prize while waging three wars at the same time? Accepting a peace prize while ordering even more troops into battle was an audacious act. It was certainly in keeping with the spirit of President Obama’s autobiography, The Audacity of Hope. Hovering in the background of Obama’s speech was a movie moment from the 1998 film, Saving Private Ryan, the story ofa farm boy who was rescued, at great risk, from the front lines during World War II. Private James Francis Ryan (Matt Damon) was serving with the 101st Airborne Division, when he was dropped behind enemy lines. When US Army Chief of Staff George C. Marshall learns that Ryan’s mother is scheduled to receive notices on the same day of the earlier battlefield deaths of three other sons, he gives orders to the 2nd Ranger Battalion of the 29th Infantry Division to find Private Ryan and bring him to safety. He is to be sent home as a comfort to his soon-to-be grieving mother. 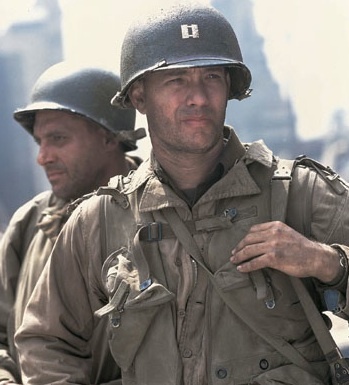 Captain John Miller (Tom Hanks), successfully leads a squad of eight men on the rescue mission. Before Ryan returns home, Miller places a lifetime burden on the young private when he says: “Earn this”. As an old man, Ryan returns to the Normandy cemetery where so many of his comrades are buried. He is overcome with grief and uncertainty. He will never know if he “earned” his rescue. President Obama tried to make his case that he understands the pain of war. He also tried to make the case that he could earn his Nobel prize while commanding troops in battle. Did he succeed? When the Nobel committee announced the award in October, President Obama struck the right note, admitting that he did not view the award “as a recognition of my own accomplishments, but rather as an affirmation of American leadership . . . . I will accept this award as a call to action”. Obama’s Oslo speech acknowledged his nation’s involvement in wars in Iraq and Afghanistan. He made no reference to the US involvement in Israel’s military occupation of a predominantly Muslim population in the West Bank and Gaza, where there is also an historic, sizable Christian minority. Leaders of that Christian community issued a call for an end to Israel’s occupation of Palestine in a document developed after a December 11 meeting in Bethlehem. The document is referred to as “The Kairos Palestine Document” It echoes a similar summons issued by South African churches in the mid-1980s at the height of repression under the apartheid regime. Which raises the theological question: Was the Obama speech Niebuhrian? Did it demonstrate a genuine moral grappling with the ambiguity of all the facts on all three fronts, two of which he owned up to? Was the speech authentic to the probing analysis of politics and theology found in the thinking of Reinhold Niebuhr, the American theologian Obama appears to have studied carefully. Since his death 38 years ago, theologians and political pundits across the spectrum have claimed to know how Niebuhr would respond to each succeeding political crisis. They see in him what they want to see. President Obama’s speech this morning in Oslo was truly remarkable. A monsignor called shortly after the President finished his remarks and said it was the best speech from a politician he had ever heard. I suspect the monsignor’s judgment was biased because the speech was, above all else, theological. And the theology was all Reinhold Niebuhr. I asked retired Iliff School of Theology Professor William Dean, if he saw Niebuhrian realism in Obama’s speech. Dean contributed to the 2009 anthology, Reinhold Niebuhr Revisited: Engagements with an American Original (Daniel Rice, editor). Dean’s essay was entitled, “Niebuhr and Negative Theology”, which examined Niebuhr’s “sometimes grim realism”. On the other hand, I have noticed that few liberal critics of the speech have asked precisely what geo-political consequences would follow if we were to stay on the current downward slope in Afghanistan. They are right to be horrified with the evil of war, but I don’t get from them the informed estimates of the consequences of avoiding the surge, which I need to hear as I struggle for a response to Obama’s policy. There is no easy answer to Dean’s geo-political question. So I kept looking. One critic of the Oslo speech returned to the President’s West Point troop surge speech for a more complete examination of the additional surges the president failed to address either at West Point or in Oslo’s City Hall. Private contractors certainly went unmentioned in his speech and, amid the flurry of headlines about troops going to Afghanistan, they remain almost unmentioned in the mainstream media. In major pieces on the president’s tortuous “deliberations” with his key military and civilian advisors, in the New York Times, the Washington Post, and the Los Angeles Times, all produced from copious officially inspired leaks, there wasn’t a single mention of private contractors, and yet their numbers have been surging for months. A modest-sized article by August Cole in the Wall Street Journal the day after the president’s speech gave us the basics, but you had to be looking. Headlined “U.S. Adding Contractors at Fast Pace,” the piece barely peeked above the fold on page 7 of the paper. According to Cole: “The Defense Department’s latest census shows that the number of contractors increased about 40% between the end of June and the end of September, for a total of 104,101. In the Oslo rhetoric Obama failed to give us the complete story. What is our ultimate goal in Afghanistan, where he has just stepped up American military presence? Rick Rozoff, writing on the website of the Center for Research on Globalization, finds in the speech embarrassing theological and biblical ignorance. Is there not a single speech writer in the White House who could have flagged this serious stumble that found its way into Obama’s speech? Unless this unsubstantiated claim was an allusion to the account in the Book of Genesis in the Hebrew Bible of Cain murdering his brother Abel, which would hardly constitute war in any intelligible meaning of the word (nor was Cain the first man according to that source), it is unclear where Obama acquired the conviction that war is coeval with and presumably an integral part of humanity. When Obama says he reserves “the right to act unilaterally if necessary to defend my nation” he does not make the case that a gang of terrorists hiding in caves (probably less than 100) constitute a danger of such magnitude that they are an immediate danger to United States. security. This is Obama’s version of the Bush era’s warning of a “mushroom cloud” hanging over America. The American people voted for change. The return of the faux “mushroom cloud” is not change. There are hiding places and supportive communities around the world capable of harboring what Obama calls evil. The President used “evil” as a noun, twice in the speech. Since “evil” is lodged in the soul of every living human, terrorist tactics may be planned where there is sufficient will, means and anger to do so. Terror knows no boundaries. It will not be defeated by war waged within boundaries. Niebuhr would have closely examined the geo-political implications behind the rhetoric President Obama used when he spoke of a “just war”–a theological category–in Afghanistan. The Afghanistan war was launched by George W. Bush on equally invalid religious and geo-political grounds. It should end now with our troops removed in a realistic and safe manner. Here are three realistic arguments for rejecting the Bush war before it becomes Obama’s war. Sending U.S. troops to fight interminable wars in distant countries does more to inflame than to extinguish the resentments giving rise to violent anti-Western jihadism. Whatever the Obama administration does in Afghanistan and Pakistan, however, the American ability to mount a sustained operation of this size in one of the most difficult places on the planet, when it can’t even mount a reasonable jobs program at home, remains a strange wonder of the world. I hate war, as only a soldier who has lived it can, as one who has seen its brutality, it futility, its stupidity. Every gun that is made, every warship launched, every rocket fired, signifies in the final sense a theft from those who hunger and are not fed, those who are cold and not clothed. 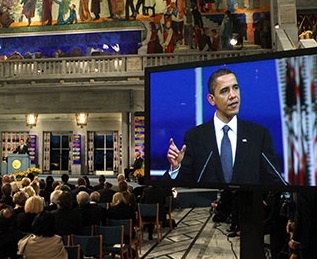 Obama’s Oslo speech was rife with vague generalities about Human Rights and International Law and he made no mention of Israel’s ongoing military occupation of Palestine aided by USA policy and tax payers funds which defies them both. Not a word was heard about Gaza, the ever-expanding illegal Jewish only settlements, not a mention of Israel’s illegal apartheid wall nor its nuclear weapons. Jim, I received your extensive comments on Obama’s efforts to justify continued presence in Afghistan after I wrote my own extended comments, in which I point out President Obama was selective in his use of Gandhi and King, at http://www.friendsofpalestiniansandisraelis.blogspot.com. I am extremely disappointed that Obama chose to make Bush II’s folly his own. Wanting to take on the role of Messiah for the Global Security of all willing nations looking to us for “security” is dubious, given the loss of the values that made us the envy of the developing nations. The commitment to “human rights” rings hollow when the thugs are “our thugs”, when oppressors are “friends” then we look the other way. As Jim Forbes (the new editor for First Things) said on the Lehrer program the night of Mr. Obama’s speech, it was “incoherent”. He tries to laud nonviolence and the “just war” theory of St. Augustine, an effort to reign in “Christian” rulers from war’s excesses; which never works, because rulers always justify their warring ways with (self) righteous rationalizations. Writers who claim to represent Christianity have some kind of duty, I would think, to appeal to a source more basic than Reinhold Niebuhr (or any other interpreter) in their analysis of Obama and war. That more basic source would be Jesus and what he said and did. Jesus truly represented another way to run the world–by truth, compassion, and love of others–including amazingly enough, enemies– as of self. That may not seem easy, nor realistic, but hey, by now, the burden of proof about realism is on those who propose that war is realistic. Jonathan Schell made that clear enough in 2003–with minimal but significant reference to Jesus–in his book THE UNCONQUERABLE WORLD. Violence begets violence, begets violence, begets violence. Human beings do have a spark of the divine within them. That is why we can learn to become non-violent and continue to search for non-violent responses to violence. What relying on Niebuhr’s geo-political balancing misses are the religious and ethnic sides of the Taliban’s appeal, a place where Bacevich may do a “patch” on Niebuhr. But the basic mistake Obama makes is to choose to fight a partly religious organization making some appeal to 1.2 billion people while neglecting principle in the Israel and Palestine, arguably a much more effective place to lessen dangers of terrorism and global resentment. You are right to catch his fundamental sin of omission, perhaps larger in impact than the visible sins of commission. Expanding U.S. incursions / aggression in Pakistan will destablizilize Pakistan, lend strength to Pakistani factions that oppose it, who are likely to make common cause with Afghan expatriates fighting the U.s. and other foreigners doing likewise (Al Qaeda), and raise the likelihood of civil conflict in Pakistan leading to nuclear weapons coming under control of those fighting the U.S. Pakistani nukes are a reason to oppose the Afghanistan escalation, not to support it. John Stoner hit the nail on the head when he said that the Jesus option has never really been tried. If all those who claim to be followers of Jesus took Jesus’ words and ministry seriously, I am convinced that there would be much, much less violence in our world today. We do need to LISTEN to what our supposed “enemies” feel and think about our actions and foreign policies (I believe that is the meaning of Jesus’ words to “love our enemies”). It’s when we don’t that the potential for more violence and war begins to escalate. It is basically an act of bravery and moral courage to listen.